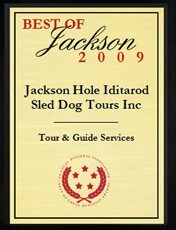 JH Iditarod receives 2009 Best of Jackson Award in the Tour & Guide Services category by the US Commerce Association. Click here to read Jeremy’s testimonial on dog sledding with JH Iditarod! 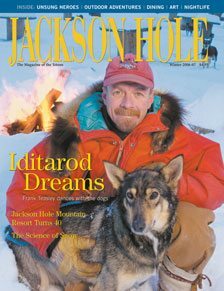 (800/554-7388 or 307/733-7388; www.jhsleddog.com; half-day excursions $160 per person, full-day $225, including lunch) is run by eight-time Iditarod veteran Frank Teasley. Let one of his mushers take you through the wilderness, where you can help command the dogs or just sit back and enjoy the ride.